Christian parables have retained their force well beyond the sphere of religion; indeed, they share with much of modern literature their status as a form of address: "Who hath ears to hear, let him hear." There is no message without there first being-or, more subtly, without there also being in the message itself-an address to a capacity or an aptitude for listening. This is not an exhortation of the kind "Pay attention!" Rather, it is a warning: if you do not understand, the message will go away. The scene in the Gospel of John in which the newly risen Christ enjoins the Magdalene, "Noli me tangere," a key moment in the general parable made up of his life, is a particularly good example of this sudden appearance in which a vanishing plays itself out. Resurrected, he speaks, makes an appeal, and leaves. "Do not touch me." Beyond the Christ story, this everyday phrase says something important about touching in general. It points to the place where touching must not touch in order to carry out its touch (its art, its tact, its grace). 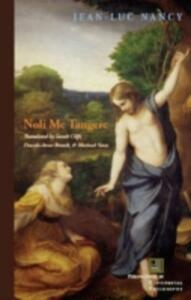 The title essay of this volume is both a contribution to Nancy's project of a "deconstruction of Christianity" and an exemplum of his remarkable writings on art, in analyses of "Noli me tangere" paintings by such painters as Rembrandt, Durer, Titian, Pontormo, Bronzino, and Correggio. 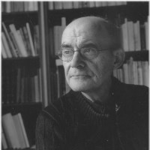 It is also in tacit dialogue with Jacques Derrida's monumental tribute to Nancy's work in Le toucher-Jean-Luc Nancy. For the English-language edition, Nancy has added an unpublished essay on the Magdalene and the English translation of "In Heaven and on the Earth," a remarkable lecture he gave in a series designed to address children between six and twelve years of age. Closely aligned with his entire project of "the deconstruction of Christianity,'" this lecture may give the most accesible account of his ideas about God.